Welcome to Fort Lauderdale's Beach. I went for a ride in a car a while back and brought the camera with me. This picture shows a lot that I'm involved with here in South Florida. The obvious thing is that I'm sitting in traffic at the beach. This is at the famous Fort Lauderdale "Strip". If you ever have a chance to see the old movie "Where the Boys Are", this is roughly where it was filmed. Connie Francis and the cast are Midwestern College kids who drive to Ft Lauderdale for Spring Break and party for a while in the sun before going home. This is what many people still do although the "Spring Break" party scene moved away. Long Story and a great study in how a good thing can get out of hand and killed by people who, depending on your view, either killed the goose that laid the golden egg by trying to Disney-ise the place, or improved the beach by allowing the place to begin a transformation into a new South Beach. I'll leave that decision up to you whether its good or not. I think "Good or Bad" depends on whether you live here or not. I remember coming down during the 80s as a college kid and it was fun then, but I went home and left the place behind. Now I live here, and have since 2006. The other thing that comes to mind is the Two Lane Initiative by Wilton Manors Main Street for the Wilton Drive business district in Wilton Manors. The idea behind it is to say, OK, We have an opportunity. Wilton Manors has a certain clientelle that floods in every evening, more in Summer. How do we as residents and business owners manage it so that we don't Cook our own Goose, and manage to make it the best we can for everyone, Resident and Tourist. We who live here know that crossing The Drive is dangerous. It is a four lane highway. All who are involved in the discussion know something must be done. We've been through this discussion as well. I won't beat that drum (too much). The picture up top shows what can be done. This picture is roughly "Phase 2" of the plan. 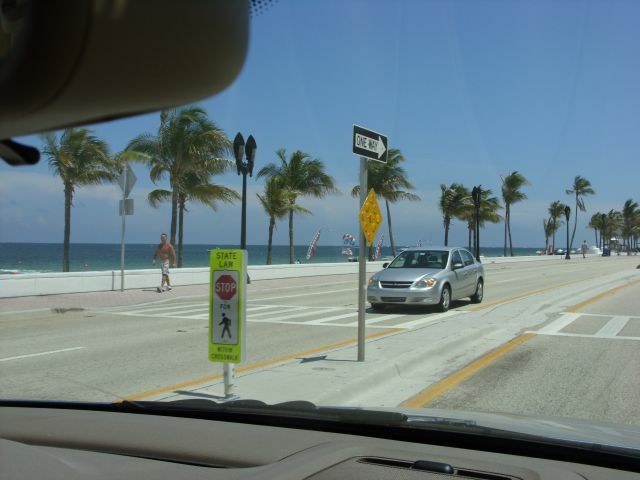 Once the crosswalks are striped, like on A1A, we put up signs that you can see here saying "Must Stop For Pedestrians in Crosswalk". Add in as many crosswalks as you can, ticket anyone who fails to yield to pedestrians and ticket jaywalkers. Make it as easy as possible - mid block crosswalks. The bottom line is that this works on A1A. Fort Lauderdale PD has undercover officers writing down license plate numbers when people "blow through the stop" and there are people crossing. They'll get the gift of a ticket in the mail once the paperwork is finished. The crosswalks are honored, and people are not dying to get to the beach except in the "Colloquial" sense. Wilton Manors has its own "Beach". It's not water, it is what organically developed over the years. It is our turn to fix our city the way we all want it. We have a resource in our tourist trade. Lets manage it well, and wisely. Lets manage it safely. Lets save lives. Stripe and add Crosswalks on the drive. If the 800 pound gorilla of Fort Lauderdale can do it, why can't we?